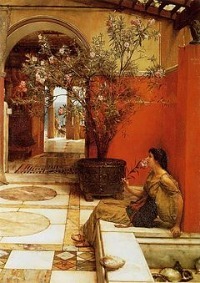 The Oleander City is a is a true perennial. Each spring Texas comes alive and is blanketed with Bluebonnets. The State Flower of Texas. During this time the Island of Galveston blossoms with the Oleander. This beautiful flowery shrub has thousands of years of history. It was brought to Galveston by one of its earliest merchants in the 1840s. The merchants relatives began growing and planting the flower throughout the island. George Sealy Jr., was the nephew of John Sealy a prominent Galveston Banker. 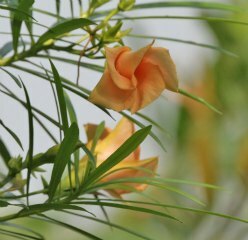 George Sealy was also a leading authority on cross pollination of oleander. Mr. Sealy established a 14 acre Oleander nursery on Galveston. Here he cultivated sixty different varieties of oleander. He was a major influence in Galveston becoming known as, The Oleander City. His mother, Magnolia Willis Sealy, was a prominent civic leader. Mrs. Sealy opened her opulent home to hundreds of hurricane survivors. It is said many of them actually washed up on her steps. Mrs. Sealy was one of the first Officers for the, Women’s Health Protective Association (WHPA) on the Island. These leaders formed a very powerful, effective group. Together they worked creating a sanitary and more beautiful Galveston in the wake of the Great Storm. The group invited women of all economic classes to participate and help. In 1912, WHPA planted an estimated 10,000 trees, along with 2500 Oleanders in the City of Galveston. 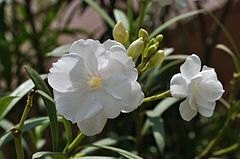 In 1921 the first Oleander Festival was celebrated. It signified the rebirth of Galveston after the 1900 Hurricane. Since that time it has been an annual event held each May. In 79 AD, a city was lost to the world. It remained buried for over 16 centuries. Buried within the city were two thousand victims of the disaster.Discovery and excavation of it started in the late 1600s. During the excavation fresco's of oleander were found painted on walls. And within the petrified ground of flower beds the roots of oleander were discovered. Some think the popularity of oleander was that it could produce inebriating honey. This honey made possible from the red flowering oleander. In everyday terms, you could get drunk from honey that bees produced from it. I think people planted it because it's beautiful. And it smells wonderful on the springtime air. It smell’s even sweeter perfuming a sea breeze on Galveston. The beautiful City of Galveston was almost lost forever. Its similarity to Pompeii with surviving remnants of oleander are poignant. Recently Galveston Oleanders survived Hurricane Ike. Ike flooded the island and killed old oak trees, but Oleander still flourish here. Leave The Oleander City and Return to Galveston Travel and Charm Homepage.